It seems like everyone and their mother knows about the book, Wonder, a tale of how to overcome the odds in an American school. I had never heard of it until I saw this film version. My partner, however, told me that this was going to be a tough watch, as she had read the book and it had left her in pieces. It might not have reached those heady heights for me but it certainly tugged at my heartstrings and has an incredible performance from a child who is proving he is better than his adult counterparts. August “Auggie” Pullman is like no other little boy. A science whizz who lives with his loving parents and sister, Auggie has never been to school until he has to enter the fifth grade for the first time. 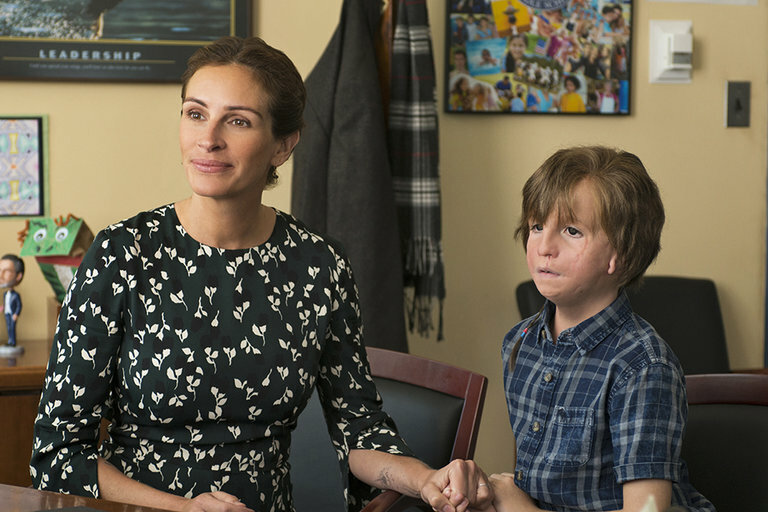 Auggie has a facial disorder that he has had to undergo several operations in his life to try and unsuccessfully fix. However, once in school, Auggie finds himself alone and under attack by bullies and those who are scared of him, believing that they might catch what he has. He has to prove himself with compassion and kindness in order to win them over. Directed and co-written by Stephen Chbosky, the man who gave us the underrated The Perks of Being A Wallflower, it would have been very easy to make a film that was layered with sentimentality. What he manages to do is keep it this side of sugary sweet and never overplays the obvious gushiness that the story obviously has. Taking the general structure of the book by R.J. Palacio, in which key characters tell their side of the story, it allows secondary parts to develop just as much as Auggie. What stands out more than anything is we are supposed to be living in a time when we are more accepting of difference and yet it is clear we aren’t. Auggie is looked upon, initially, as if he has the plague and should be avoided at all cost. Only the principal and his teachers see beyond the facial disability. Where he finds his true solace is at home, surrounded by his overprotected mother, his laid-back father and his sister, who has had to sacrifice so much for her brother and is coming to the point where she craves the attention he naturally gets. This isn’t a film about acceptance but more about changing attitudes. Children can always be the cruellest because they don’t have as much of a filter as adults, yet for Auggie, he does his best to ignore the stares, it’s the hatefulness that comes with those stares, as the school’s rich kid doesn’t even allow himself to see beyond his face and in one key scene, you understand where he gets that failure to understand when Auggie is airbrushed out of a school photo. The performances are terrific, made up mainly of a young cast of children who never cross over that line of pretentiousness. Julie Roberts is perfectly suited as the mother who is so afraid of what will become of her son. Without laying on the melodrama, she underplays the part nicely, brings a warmth to her character so we truly appreciate what she is going through. 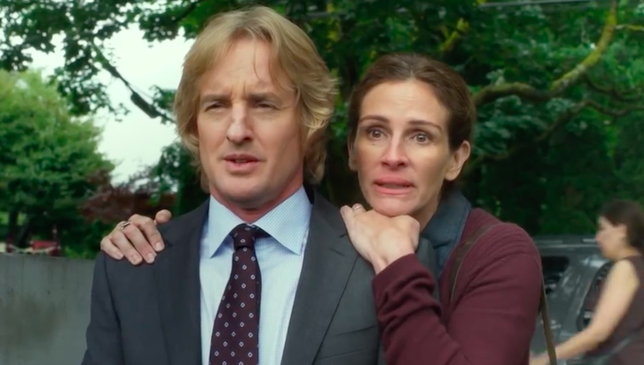 Owen Wilson, as Auggie’s father, was born to play the role. Cool, charming and fun, Wilson’s screen charms tick the right boxes for this role. Izabela Vidovic, as Auggie’s sister, has the more difficult part of not making her cruel or unkind, even though she is feeling left out slightly. It’s a well-judged performance. 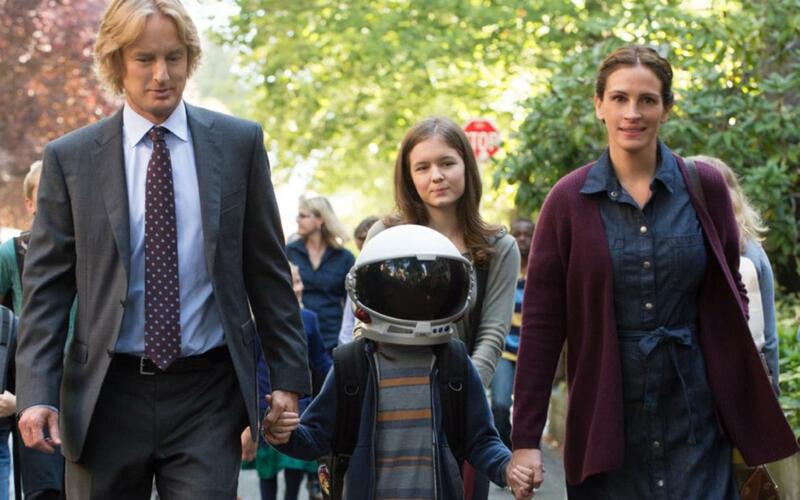 As Auggie, Jacob Tremblay excels. Already proven himself in the 2015 film Room, Tremblay shows a level of maturity in his performance that both surprises and delights. You cannot help but fall in love with this intelligent young man who has hidden from the world for so long and now has to face up to the cruelty and prejudice that people can have, just for not looking the same as everyone else. There is a level of maturity in his performance that shines through and as he was sorely overlooked for Room, he should be lauded with accolades for this. It is magnificent. 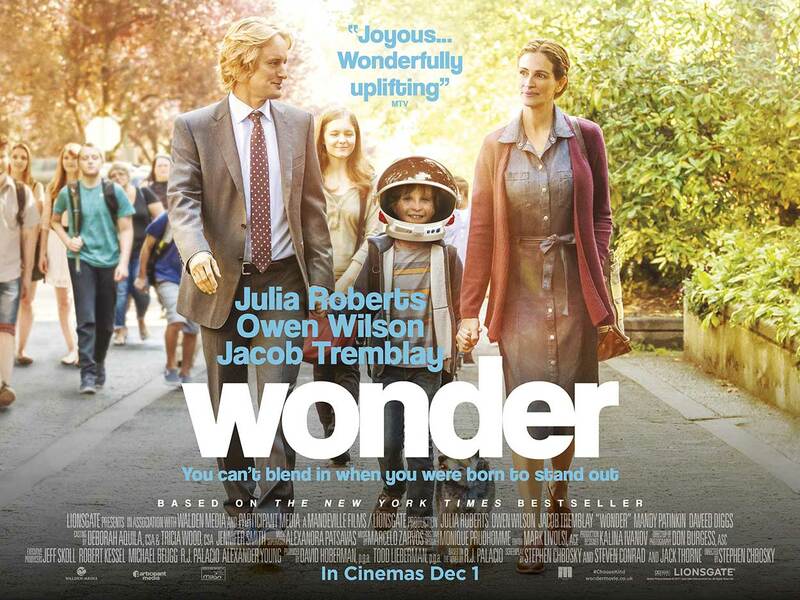 Wonder lives up to its title. It is charming, warm and funny with loads to say about our attitudes to things we don’t understand. It will tug quite hard at the heartstrings and even though the ending is a little too obvious, it would be a hard-hearted person who isn’t moved by Auggie’s plight. A family film with a huge message that isn’t hammered home but you will come out feeling what the world needs more now than ever is kindness.